If you've been to the Tofino Botanical Gardens or SoBo recently, you've probably heard the sounds of saws and hammers as you're munching your polenta fries. Or maybe you caught a glimpse of the red siding of a new building through the trees. If so, you are watching a carefully planned vision come true--the nonprofit Botanical Gardens Foundation will soon be providing affordable accommodation for students and researchers. 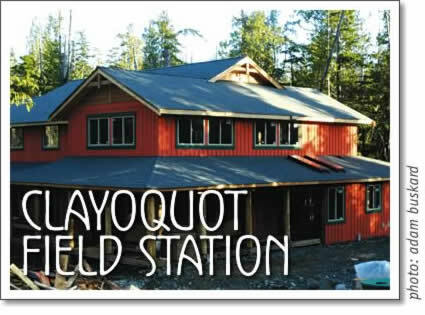 The new building is called The Clayoquot Field Station (cfs) at Tofino Botanical Gardens. It's a dormitory-classroom facility that can accommodate up to 32 guests. In addition to 8 bunk rooms, there are 2 classrooms, a large shared kitchen and dining area, 2 seminar rooms, two private suites and all of the standard amenities you'd expect in a dormitory. The building is on schedule to be completed by May 15th. The Clayoquot Field Station's mission is to initiate, encourage, and enable research, education, and conversations that will help people to understand how to live in a place without diminishing it. To carry out this mission, cfs welcomes gardeners, surfers, elementary school kids, graduate students, retirees: artists through zoologists and everyone in between. About a million visitors per year come to Clayoquot Sound to experience its natural grandeur. Sadly, this living laboratory of the ocean, rainforest and mountains gets looked at but what gets overlooked are the questions of how we can live and visit here in a sustainable manner. Questions like: How can we maintain our rich native biodiversity? How can we produce fresh, healthy food closer to home? How does the area's cultural past, present and future align with the region's political and economic expectations and demands? So the next time you're savoring SoBo's shrimp cakes or visiting the medicinal herb garden, stop for a moment and imagine you are in a place of learning. Picture the vanload of university students from Green River Community College that will be arriving in July to study Clayoquot Sound's ecology and culture. Envision local school kids learning how to build healthy soil to grow fresh food. Picture your mom and dad staying in the dormitory where a dinnertime conversation might compare the differences of a bog forest to a temperate rainforest. Or think about signing up for the health and wellness retreat in August, where you can practice yoga, eat fresh food and better understand the geoclimatic sources of good surf with an international crowd. Check out the website, tofinobotanicalgardens.com for more information and current updates about cfs. After that, you can sign your parents up for "Clayoquot 101" so they can learn something about the place where you live. Or give the gardens a call to ask how your cousin's school can use the dormitory for a field trip to Clayoquot Sound. Watch for the field station's open house announcement so you can celebrate this exciting new project (and get some polenta fries on the side!). Sarah Platenius is a certified massage therapist and yoga instructor currently studying outdoor environmental education with her 2-year-old son, Reed. Thanks John Platenius for "the interview".